This chapter draws together some of the findings from the previous chapters and considers a structural approach to desistance which challenges both patriarchy and neoliberalism as well as other systemic inequalities such as neocolonialism, racism and heteronormativity. The chapter considers the personal experiences of the women’s lives to be political, linking, for example, interpersonal relationships to the structural violence of austerity which has led to the decimation of domestic violence services and mental health services. The presence or absence of agency in the lives of criminalised women is explored. Agency and subordination, it is argued, can exist simultaneously in both offending and desistance experiences. 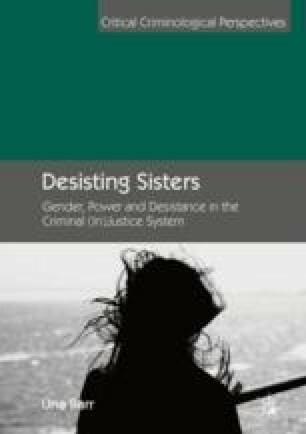 The chapter argues that abolitionist arguments are compatible with desistance theory and practice and makes the case that interstitial strategies can be employed to support women’s desistance, outside the punitive Criminal Justice System. The chapter concludes that desistance from crime should be reframed, both theoretically and in practice, as desistance from harm. In desisting from harm, therefore, women are actively resisting patriarchal and neoliberal structures. Carlen, P. (2012). Against Rehabilitation: For Reparative Justice. Centre for Crime and Justice Studies. Available at: https://www.crimeandjustice.org.uk/resources/against-rehabilitation-reparative-justice. Accessed 27 Dec 2018. Coles, D. (2018). INQUEST Responds to New Ministry of Justice ‘Female Offenders Strategy [Blog]’. INQUEST Available at: https://www.inquest.org.uk/moj-female-offenders-response. Accessed 27 Dec 2018. Fraser, N. (2013). How Feminism Became Capitalism’s Handmaiden. The Guardian. Available at: https://www.theguardian.com/commentisfree/2013/oct/14/feminism-capitalist-handmaiden-neoliberal. Accessed 27 Dec 2018. Inquest.org.uk. (2018). Deaths of Women in Prison. INQUEST [online]. Available at: http://inquest.org.uk/statistics/deaths-of-women-in-prison. Accessed 27 Dec 2018. Jacobson, M. P. (2016). Tough Talk on Crime Has Led to a Crisis in Britain’s Prisons. The Guardian. Available at: https://www.theguardian.com/commentisfree/2016/may/05/tough-talk-crime-crisis-britains-prisons-suicides-assaults. Accessed 5 Jan 2019. Savage, M. (2018). Private Probation Firms Fail to Cut Rates of Reoffending. The Guardian. Available at: https://www.theguardian.com/society/2018/feb/03/private-firms-fail-cut-rates-reoffending-low-medium-risk-offenders. Accessed 5 Jan 2019. Watts, J. (2018). No Wonder People on Benefits Live in Fear. Supermarkets Spy on Them Now. The Guardian. Available at: https://www.theguardian.com/commentisfree/2018/may/31/benefits-claimants-fear-supermarkets-spy-poor-disabled. Accessed 27 Dec 2018.